Create a 20x25 yard grid. Adjust the size of the grid based on the number of players and the skill level of the players. Place all of the players in the box with a ball. The two coaches are the "Monsters" in the game. Have the players dribble in the grid. 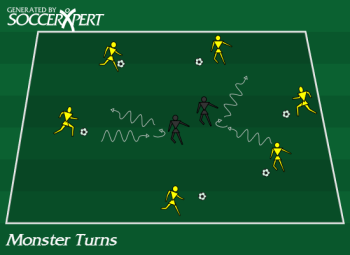 To receive a point a player must dribble at the monster, execute a turn to get away from the monster without being tagged by the monster. Play for 30-45 seconds and play again and have each player to attempt to beat their score. Players should keep the ball close within playing distance. Players should accelerate to get away from the monster.